There’s hardly a Met fan alive who hasn’t been told at least some of the team’s story by Marty Noble. The reporter, who today writes for mlb.com, is now beginning his 38th season covering Mets baseball, and traces of that history inhabit nearly everything he writes. Much of his best stuff can be found around this time of year, when he’s the only writer who’ll get a story out of whichlockers are occupied by whom and, as always, his readers will learn a thing or two about uniform numbers – a topic that he’s definitively chronicled, albeit in passing, for as long as I’ve been reading the sports pages. 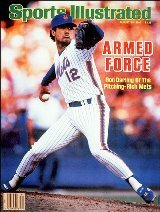 It was a thrill to contact Marty, first to solicit a blurb for the Mets by the Numbers book, then for an interview that became a lengthy conversation, and then another. Following is part 1 of a multi-part series. Enjoy! Remind me of your background in journalism. My first professional job was in Vermont but in 1970 I began working for the Herald News in Passaic, which has since been overtaken by the Bergen Record. I worked at the Record from July of ‘72 through the end of 1980. I covered the Mets and the Yankees then, split almost 50-50, all their home games. I covered the Yankees only the road when they were close [to the pennant], so that meant, no Mets in ‘76, ‘77, ‘78 and ‘80. I also covered the Yankees on the road in 1974. Did you aspire to be a baseball beat reporter? I worked for a paper but didn’t have any thoughts of covering baseball. Then in ‘70, I covered my first game and in ’74, with the Bergen Record, they said, ‘You’re going to cover the Mets.’ I was fine with that. It got me out of the office and doing things that were a little more high-profile than high school stuff. And it rekindled the affection I had for baseball. I lost my way in baseball when I got to high school and the Yankees were such a terrible team. But it came back when I went to cover it. You are a Bronx-bred Yankee fan, correct? Yes. I grew up on Tremont and the Concourse around 176th Street. The ballpark was 161st. That’s 15 city blocks or three-fourths of a mile. We could run there if we had to or take the subway for 15 cents. Oh, it is a fascination. There’s an origin to it, but there is no basis. What I remember is thinking that Yogi Berra looked right with Number 8 on his back. He was bowl-legged, and his back was round, and 8 was the number. I just liked it. Mickey being No. 7 was the most important thing in the world to me. I wore 7 a lot as a kid because of him. And I just started to notice it more. Gil McDougald was 12. The first pitcher I ever saw live was Tom Sturdivant, No. 42. I can hear Bob Sheppard say, “Numbah fawty-toooh.” The way he said it just made the number better, sound more official. The way Sheppard said them was a big part of making them sound important to me. Everyone wanted to be a Yankee, but sometimes I wanted to be Bob Sheppard. I have since met him and really admire him. Everyone has their favorite names for him to introduce. Mine were “Otto Velez” and “Oscar Gamble.” He wrote me a poem about his. His favorite name was “Sal-oh-may Bah-ro-haas.” The whole periphery of baseball appealed to me. The numbers, the way Bob Sheppard said things, the special feeling at Yankee Stadium. I’ve seen a lot of fields, Griffith, Crosley, the Polo Grounds, Fenway. There was something about Yankee Stadium – the smell of cigars and stale beer, which doesn’t exist because they don’t let anyone smoke anymore. I miss the cigars. That smell was special to me. Walking up the ramps, hearing Sheppard, seeing all that green was something. And to see the players from that distance you had to see the numbers. Was I seeing Andy Carey? Or was I seeing Hank Bauer? Now I can look at those players without their numbers and tell you who they are but then I needed the numbers. I guess knowing numbers it’s like knowing the flip side of a 45. It seemed to be the right thing to do. Tom Sturdivant finished his career with the Mets in 1964. Do you remember his number? I have no idea. [It was 47 –ed.] My memory of Met numbers starts only when I started covering them. I didn’t have much thought about them then. I want to say Jesse Gonder wore 12, but I’m not sure of that. That’s one I remember, because he was a Yankee. I also remember the ‘69 Mets. I was just getting into the game again thanks to Bob Gibson, who really re-kindled my interest in baseball as much as anyone. He is my all-time 45, with all due respect to Tug McGraw and John Franco. Gibson. If I could be ay player, I’d be him. He was so amazing. 45 doesn’t have any real intrinsic appeal to me, like 8 did or 44 did. Gibson made 45 better than it was. Those Cardinal teams in the late 60s, if you think of the guys who came out of it – Gibson, McCarver, Torre, how articulate they are and how much understanding they have of baseball, that fascinates me. We’re way off topic already but one of the areas of Mets history that fascinates me is how Bing Devine, who obviously had such a big role in building those Cardinals teams, basically assembled huge parts of the ‘69 Mets team in one year as a general manager. When did you as a reporter introduce numbers into things that you were writing? I was always interested in doing it, but it takes a little while in the clubhouse before you can act the way you really are. You have to stay in self-created guidelines of what is normal. But once you get more comfortable you can say and do whatever you want. If they like you, they like you. If they don’t, too bad. It happened in the first spring I was there in 1976. The first time I remember something that happened that I took notice of is when Mazzilli and Stearns switched 16 and 12. I used to pester Herbie Norman, the clubhouse guy, about numbers. Because there was that fascination. It’s like rock and roll. I knew that Yogi had at one time worn 35 and that DiMaggio had worn No. 9. And Mickey wore 6. I read everything I could about Mickey when I was a kid. Covering uniform numbers was not something the other writers did. That’s true but I don’t want to say I broke any ground. I did a piece for mlb.com on who used to inhabit the locker room. One of the lockers had gone from Darryl to Bonilla to Olerud to Zeile. It was always a big home-run hitter who had it. I didn’t think it was important but it was fun. And in ‘06 I wrote a story pointing out that Billy Wagner had been given Doc’s locker. And that locker hadn’t been assigned for a long time. I told Billy, do you know the best fastball in Mets history was in that locker and Billy, who loves history and loves fastballs, just sat up and asked who? 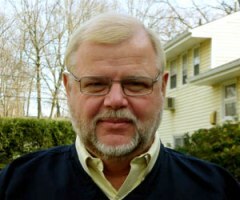 Seaver? I told him it was Doc’s locker – only I’d forgotten he and Doc were teammates for a short time. How could they give Steve Traschel Tom Seaver’s locker? How could they give Luis Lopez Keith Hernandez’ number? I’m not saying that’s important to the team but some of it is important to the fans. It has zero importance to some of the players. They ask, ‘Who cares about that? Why’d you write that?’ But the readers care. Do you have an opinion on the No. 17 controversy? It should be retired for sure. It goes Seaver, Keith, Piazza and then everyone else in Mets history. Those are the three most important players in the history of the organization. Seaver was the driving force behind the first championship and whatever other success they had then. Keith was the force in the second run. And Piazza was the focal point of their most recent success. Now, David has to get them back into the playoffs to make 5 that important. Do you feel the Mets are aware of the controversy? I don’t think they have the feel of it in their hearts. Over the years the front office has changed so dramatically. If Bob Mandt were still there things might be different. I know nothing of the Mets’ feeling on this, but what they might be doing in a real sense is to make it as special as they can. Seaver and Gil were obvious. As opposed to the Yankees, who say, if you have a heartbeat you can get your number retired. I’m glad some guys got it, but I don’t think Maris deserved it. I don’t think Elston Howard deserved it and I love Ellie. It’s a reassuringly high standard the Mets show but from a standpoint as a fan, it sometimes seems like they’re not paying attention. It’s like they don’t always grasp the historical implications of the things they do with the fan base. I agree with that. I’m not sure what they’re going to do with Straw and Doc. Gooden might not ever be back. Straw was supposed to have a job with the organization but I don’t know what happened. They seem very concerned about bad reactions. They are concerned about the Yankees and they are concerned about looking bad. Of the players you recall, any who were particular about the number? Charlie was pretty good about keeping some numbers the way they always were. Like, 23 was never a pitcher’s number. I don’t know if that’s still the case. Yeah, a lot of things got bastardized, even the lockers. There used to be a pitcher’s row then Piazza got put in it. Seaver had a locker that was meant for, if not the guy with the most tenure, the guy with the best quality. And Steve Traschsel, as much as he had tenure and as much as I like him, didn’t belong in Seaver’s locker. They had no one who belonged in Seaver’s locker. Guys ask for numbers when they come to the team. I think Delgado wanted to honor Clemente more than he wanted to ask Matsui for 25. I always thought 36 was for good guys. Koosman was as good a guy as there is, and Eddie Lynch is a friend. What number did Desi Relaford wear? Well, Desi Relaford should have been No. 36, I told him that, because he was as good a guy as the Mets ever had. I forget some numbers. I mean David is 5 and Jose is 7. Those are the easy ones. Valentin switched 18 to 22 because Alou wanted his number. I wrote about that. Though it seems that if Valentin had a number he was preferential to it was 22 since he’d had equity in it in previous stops and he couldn’t wear it because Xavier Nady was in 22. There’s one! If you looked at Nady from not too great a distance, you’d think you were seeing Kevin McReynolds. McReynolds might have been a little thicker, but exactly the same body, same number 22. I remember looking up and just seeing him. That’s the thing. All my references are old. I see the 80s and 90s. But Nady was just like McReynolds. He was 22, McReynolds was 22, Knight was 22. I thought in ‘88 if McReynolds had had a really good postseason he could have been the third straight Met to win a World Series MVP in 22 [Donn Clendenon in 1969 and Knight in ’86 being the others]. And if a lot of things go different in 2000, maybe you’d have Al Leiter. That error doesn’t get enough attention in the annals of all-time baseball screwups made in the postseason. The reason it doesn’t is that the Yankees are going to win that World Series regardless. I don’t believe that. I think the Mets are still batting in the 6th inning of that game if it doesn’t happen. What I remember in that World Series is Paul O’Neill fouling off a billion pitches and working a walk off Benitez. Benitez was fried when that happened. What do you recall about covering Ron Darling? He wore three numbers. 44, 12 and 15. When Aggie took over 15 after Foster was released, Darling told him, ‘Don’t wear that number, you won’t hit!’ (laughs) That’s why it pays to pay attention to uniform numbers. A quote like that was wonderful. That David Cone took 17 as a tribute to Keith was wonderful. You’re more aware if you’re pay attention. I pay attention to 7. John Gibbons had 8 and went to 7 when Carter got there. I remember Dozier, Krane, Reyes. And for some reason I know Kranepool wore 21 when he first came up. Franco made his life in 31 but was very unselfish the way he moved to 45 when Piazza arrived. John is not my favorite guy ever, but I have great respect for him for doing that. That was a very unselfish thing to do. Numbers for me are not an active obsession, it’s a background thing. But when it scratches the surface you think about it. Still to come: Part II of our interview, when we address the 2008 club and recent Met history.